The increasing complexity of the pollution contained in urban sewage together with the increased severity of legislation aimed at conserving the environment has given rise to the development and application of advanced treatment. 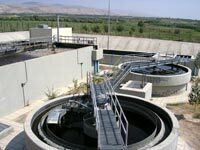 AQUATREAT has a wide range of wastewater services meeting industrial and municipal needs. These services include studies for determination, treatment, pollution control, sludge and water quality management. AQUATREAT offers rehabilitation of existing collection facilities as well as design and building of new systems including pumping and lifting stations, pressure pipes, new laterals, mains, and interceptor sewers, which meet current and future needs. Alongside conventional and oil processes, AQUATREAT has developed considerable expertise in compact plants. Some of these require as little as one tenth of the land area taken by standard plants and therefore can be integrated with the existing facilities. These technologies are particularly suitable for plants fully enclosed in buildings or for underground treatment facilities. AQUATREAT activities range from skid mounted wastewater treatment plants to custom built treatment plants with a capacity of up to 1 Million PE and are designed to meet effluent requirements under current and projected future conditions. AQUATREAT services include studies for determination, treatment, pollution control, sludge and water quality management. AQUATREAT offers process steps as well as complete plants for the industrial process treatment. Our customized solutions are tailor made and are based upon the development of won processes. AQUATREAT offers rehabilitation of existing collection facilities as well as design and building of new systems including pumping and lifting stations, pressure pipes, new laterals, mains, and interceptor sewers, which meet current and future needs. AQUATREAT activities range from skid mounted industrial effluent treatment plants to custom built treatment plants with a capacity of up to millions of gallons and are designed to meet effluent requirements under current and projected future conditions. AQUATREAT modern membrane techniques are applied to an increasing degree, which due to their versatility open up a wide range of applications.